My interest in numbers probably started from a very early age working out the expected winnings from my Auntie's accumulator or working out the number of possible doubles and trebles from horses picked to be able to calculate stake money. I didn't realise it at the time, but working out the return from a 50p double on a 6/4 and 15/8 shot was a great intro into probability and ever since I've had a huge interest in betting. I rarely bet however partly because I know the bookie marks up odds to give a total probability of over 100% so I would expect to lose money in the long run (unless I take the view that I'm better placed to allocate odds than the bookmaking industry, which I'm sure has led to the bankrupting of many an 'expert'). 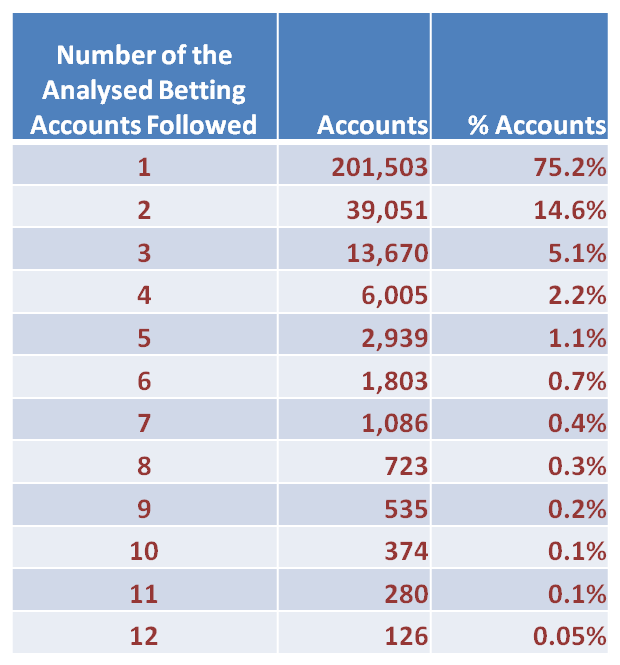 Due to this interest, I've used Bookmakers as my most recent example of organisations using Twitter, I've put together a case study that looks at the Twitter following of a number of major accounts involved in the betting industry. 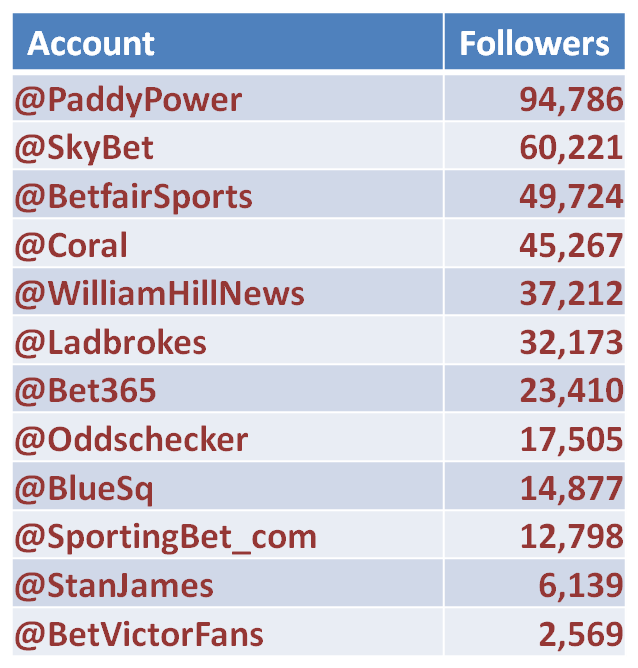 Huge variation in overall followers from some big accounts such as Paddy Power (@paddypower) which is now around 100k followers down to Bet Victor (@betvictorfans) which has only a few thousand. Over three-quarters of the c268k following one or more of the Twitter accounts we looked at followed only one of the accounts which was surprising. Where a serious punter might have several accounts to enable them to get the best odds on a market, it's arguable that an average punter might just stick with one. This is probably reflected in the relatively generous free bet offers that bookies use to tempt new punters. If you are serious punter there's a big difference between 6/4 and 15/8 but if you're putting your money on markets such as first goalscorer where the bookies margin is far bigger, getting fractionally better odds is far less of an issue. 'Come for the banter, stay for the odds' seems to be the motto of the more successful Twitter accounts with a number of the ones with bigger followings including jokes, pictures of WAGs in their underwear etc., as a means of getting their account visible beyond their own followers by attracting retweets (and hopefully as a result extra followers). Twitter can be a lot of work for little reward, the sheer volume of tweets means that your message can easily get lost in the mass unless it has something that makes it stand out. Analysing some of the responses from the bit.ly from some of the accounts often gave click-through values in single digits. The full case study is available to download at the Analysis Marketing website.